For healthy meals, the best electric grill is the perfect buy. Typically, they feature a slanted grill surface that siphons off the fat so the meat doesn’t reabsorb it. Alternatively, they’re also great for making the perfect panini, and some can even convert into a BBQ for convenient cooking in your back garden. For recommendations on the best barbecue to buy for summer, we've got lots. Or, head to our garden hub page for help with jazzing up your outside space. What is the best electric grill? The Sage by Heston Blumenthal the Smart Grill Pro is the range to rely on if you’re looking for the best electric grill (or any kitchen gadget for that matter). While the appliances are expensive, they offer you that bit more when it comes to functionality and finesse. Alternatively, the George Foreman indoor and outdoor grill can convert into a BBQ for convenient cooking in your back garden. Something to think about if you're after the best of both worlds. When you’re looking out for the best electric grill for you, it’s worth noting that electric grills are designed to be either open (flat and BBQ-esque) or contact (they open and close to cook meat from both sides). Measured in Watts, the models on our list range from 1500W to 2400W. A grease drip catch is handy to have to catch the fat that runs off your meat while cooking. Something to think about if you can't stand washing up, but also something to ignore if you don't own a dishwasher. For tender, juicy steaks, even when you prefer yours well done, this electric grill designed by wacky chef Heston Blumenthal shouldn’t let you down. It features five settings for cooking rare to well done and all levels in between. Use the probe to test whether your meat is at the right temperature for resting so the residual heat doesn’t overcook your steak, and thanks to its fast searing capabilities, the grill locks in all the juice for a piece of meat full of flavour. The best electric grill you can buy, bar none. Coming in much cheaper than the Sage electric grill, this alternative by Tefal also delivers on the technology front. From a sensor that detects the thickness of the meat and automatically adjusts the temperature, to the cooking level indicator which lets you know when your meat has been cooked to your liking, there’s plenty of factors that make this electric grill worthy of our top 5. Perhaps its most favourable function is its six automatic cooking functions, which enable you to cook burgers, sausages, poultry and fish to perfection. If you like to be savvy with your money, this electric grill can double up as table top cooker and BBQ. 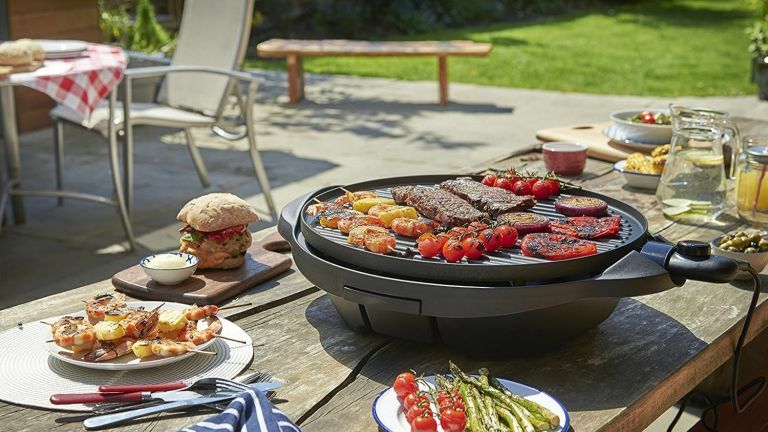 Whether you’re taking on the cooking responsibilities at a summer BBQ or cooking a healthy mid-week dinner for the family, this trusty George Foreman should enable you to do it with ease. You can easily control the temperature of the electric grill so it provides the right amount heat for cooking different meats or fish. The outside temperature gauge will enable you to keep an eye on the temperature inside, too. The best electric grill for those after something that can be used both indoor and outdoor, we think. If you’re looking to get plenty of use out of your electric grill, go for this great all-rounder. It features double sided plates; ridged for steaks and panini and flat for pancakes. If you love toasting panini for lunch, the floating hinge adjusts to administer the right amount of pressure. There’s also 5 heat settings which will ensure perfect cooking for all ingredient types, whether it’s meat, fish or vegetables. We think it's the best electric grill for versatility. With the capacity to cook up to four portions, this is the best electric grill for families. It features the classic George Foreman slope design which drains off as much fat as possible and non stick plates which remove the need for you to use oil or butter when cooking. You can use the ‘melt’ function to create the perfect cheese toastie or garlic bread, while the floating hinge allows you to place thick panini or pieces of meat on the grill.